All the cool countries are building flying drones these days, and Japan is no exception. It is 42cm in diameter, 350g in weight and can fly for some 8 minutes, being capable of reaching speeds of 60km/h. Autopilot systems are said to be under development. Interestingly, the machine's developers claim to have bought most of its components in Tokyo's Akihabara district, a notorious geek haven and technological mecca. 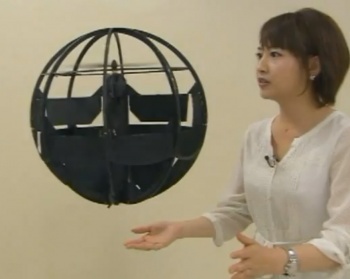 Word of Japan's flying drone sphere comes hot on the heels of DARPA's robotic hummingbird drones, and like its avian American counterpart, Japan is hoping the sphere will prove invaluable in surveillance and reconnaissance roles. Of course, since Japan's military is dedicated entirely to defense of the country, it's unlikely that these floating black balls will be darting around the deserts of Afghanistan any time soon. Though still officially a prototype the "spherical flight vehicle," is already a hit with the media. Anywhere else that would translate into a thoughtful televised exposÃ© on the device, but this being Japan, things are done a bit differently. Translation: They filmed the drone chasing an attractive young woman up a flight of stairs. Truthfully I was a bit non-plussed about the idea of yet another autonomous drone until I saw footage of the thing in action. Not only does it seem incredibly capable -- that bit where it rolls around on the ground seems to demonstrate a brilliant design capacity to avoid impact damage -- but it also exudes an air of Orwellian menace purely by virtue of being a hovering black sphere. Of course, this being Japan, things are done a bit differently. I won't be entirely shocked if the final production model of this thing is sponsored by Sanrio and sports a dainty red bow.